Pinus squamata commonly known as the Qiaojia pine is an incredibly rare species, referred to in some cases as the world’s most endangered pine. 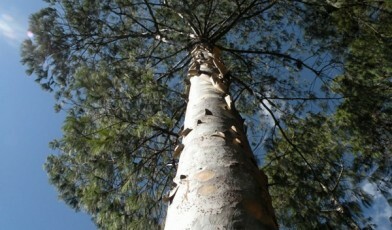 The full characteristics of the tree are still unknown as no fully mature specimens have been recorded. However it is expected that the pine would grow to around 30 meters. The species grows in secondary forest and grassland at relatively high altitudes, the current population is restricted to a mountain slope in Yunnan China. Until the current population was discovered it was thought that Pinus squamata had become extinct in the wild. The species is believed to be naturally rare but its current situation is worrying as there are only roughly 36 individuals left. The main threat to the species is the fact that its numbers are so small and in a single isolated community, meaning it is susceptible to freak climatic and genetic events. Another key concern is that the surrounding area is prone to forest fires and other species in area have suffered due to climate stresses, such as pollution and a change in conditions. Action has been taken, with the area surrounding the trees being converted into a nature reserve with the support of local businesses and communities. A project has also been put into action which has seen the collaboration of local farmers and foresters to cultivate seeds of Pinus squamata with promising results. This species is reported as held in 0 ex-situ collections.